FRANKLIN, TN -- (MARKET WIRE) -- May 22, 2007 -- Downloading music in your car is about to become a reality, thanks to a new service announced today. 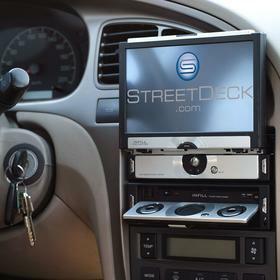 StoreBlocks™, the fourth generation digital media services engine offered by PassAlong Networks™, developer of digital media innovations, today launched a music download store for MP3Car.com, parent company of the in-dash StreetDeck™ all-in-one mobile electronics package for navigation and entertainment. PassAlong is partnering with MP3Car/StreetDeck and Gracenote® to develop in-car music discovery and music downloading capabilities that would allow passengers to click-through an in-dash application to purchase songs. This new technology was recently showcased by BMW and Intel at the Geneva Auto Show. "We see the automobile as the ultimate download machine," said Dave Jaworski, co-founder and CEO of PassAlong Networks. "As the digital ecosystem expands beyond computers, we believe that a large amount of music discovery and downloading will begin to take place in the car. Our goal is to help provide the infrastructure necessary to make that Connected Consumer™ experience the best possible." The MP3Car store will feature PassAlong's catalog of 2 million raw MP3s. MP3s are ideal for in-car downloads because of their inherent interoperability and the cross-platform ease of use that consumers will desire from their in-car selections. "Most consumers spend a lot of time in their cars, therefore making it an essential part of the digital media ecosystem," said Ben Bajarin, analyst for Creative Strategies. "Consumers frequently discover new music in their cars and with this technology they will be able to bookmark it for later or download it on the spot. Either way, consumers will expect a seamless experience from one part of their ecosystem to the next, and that includes the ability to automatically add the music to their iPod or MP3 player." The StoreBlocks premium services currently power more than 100 online music stores, including BreakthruRadio, TransWorld's f.y.e. online music store and Procter & Gamble's Julie's Jukebox, a digital music store on HomeMadeSimple.com.